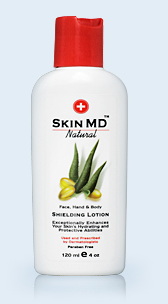 Skin MD Natural Shielding Lotion is formulated to be far more effective than mere moisturizing lotions or protective creams while utilizing mostly natural ingredients. Seven years of research and development and 741 test batches resulted in a new proprietary blend of "super" humectants six times more effective than the industry standard, glycerin, at hydrating skin. Our customers tell us that Skin MD Natural is most often able to effectively treat the toughest dry skin and help resolve hard to handle skin conditions such as eczema. Skin MD Natural uses a blend of natural ingredients in combination with significant recent scientific advances to hydrate and help heal dry skin without any greasy residue, harsh fragrances, or other potentially toxic ingredients. Conventional lotions simply attempt to replace lost moisture with artificial moisture. Skin MD Natural works differently by helping keep moisture-robbing irritants away thus enhancing the skin's inherent ability to moisturize itself. This easy-to-apply, fast-absorbing lotion helps protect against many household, cosmetic and other commonly used products that can lead to skin disorders or just plain dry cracked skin. With natural ingredients, and a promise to hydrate even the most sensitive skin, I was intrigued to see if Skin MD Natural did the trick for my seemingly overly-sensitive skin. After a harsh Winter, and long subsequent days spent indoor in the heat, my skin has been terribly dry. After applying Skin MD to my arms and hands I immediately noticed that the light non-greasy formula easily absorbs into your skin leaving it soft and silky smooth. Given that the formula seemed so light, I did a rare (really unthinkable because I'm VERY cautious about what I put on my face) thing and smoothed it onto my face, and the outcome was a pleasant surprise! I normally cannot put just anything on my face, however, Skin MD Natural's light non greasy formula (with SPF 15) has proven to be the perfect solution for my complexion issues. It does not clog my pores, it lightly hydrates, and most importantly, with the included SPF, it protects my face from daily sun exposure, ultimately preserving the youthful look of my skin (and hey, who doesn't want to do everything they can to preserve that!). 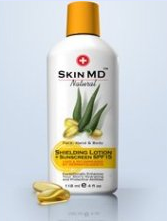 Skin MD is also offers an equally effective original formula without an SPF. Overall, impressive results from the lightweight hydrating formula from Skin MD Naturals! Experience the lightweight difference of Skin MD! One Lucky Reader will receive a bottle of Skin MD Original Formula and a bottle of Skin MD + SPF 15! Leave a comment~ Why are you excited to try Skin MD Natural ? The Comment is considered your entry. Entry to this giveaway ends at 12pm PST May 8, 2011. Winner's are chosen randomly through random.org. Winner's may not have won a previous Enjoy Lighting Giveaway. The winner will be announced in a post within 7 days of the giveaway ending, and contacted through email. The winner will have 48 hrs. to respond or another winner will be chosen. I need something that works but doesn't feel greasy. I am a public follower of your blog and I would love to try this because I am always looking for new face products to try and I especially love that it is natural. I am slowly making a switch to organic/natural products! I'm still looking for a lotion that my whole family can use that does a good job and isn't greasy feeling. I'm excited to try it because it sounds like a very good product. I would like it because I would like to only use natural products on my kids and their skin has been really dry lately. gfc teressajoe excited to try because I love trying new things, and its natural ingredients. follow you twitter teressajoe teressajoe@comcast.net oops forgot email in first enry~sorry. I have extremely dry skin which aggravates my edema, so I'd love to find a lotion that works well. I am excited to try them because I have a very sensitive skin and I think natural products would help it.